Without being biased, the number one reason to visit Keelung has to be the Taiwan street food! Below is a list of some of the other great reasons to come and enjoy this city. The food here is cheap and delicious. Taiwan street food. dumplings, noodles, soups, seafood, steamed buns, sweet things, savory things. Many menus and signs are purely in Chinese, which I cannot read, so I either just randomly pick something or look at someone else’s food and say “yiyang.” It usually turns out pretty good. Everywhere you go in Keelung, there’s good Taiwan street food available (local and international dishes), no matter what time of day. The Taiwan street food here is so good it deserves its own category. 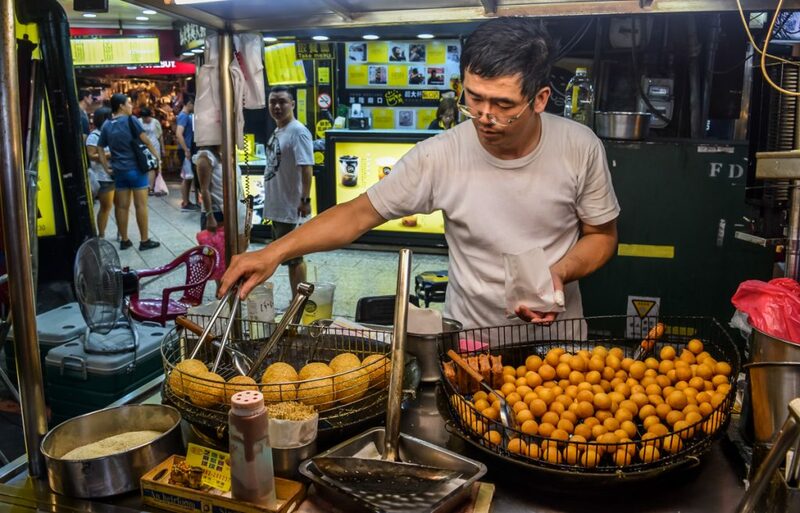 As they are two of Keelung’s major draws, you cannot leave without sampling the best of Taiwan street food from these locations. And they don’t disappoint. Every night, you can walk into a new world full of fascinating sights and smells. At Miaokou Night Market, you can find cheap and delicious snacks, meals, drinks, and desserts ranging from foods you’re comfortable with to foods that make you think “I’ll never try that in my life” but which you end up trying and maybe liking. Of course, Kanziding Fish Market gives you a similar feeling yet has its own unique charm. 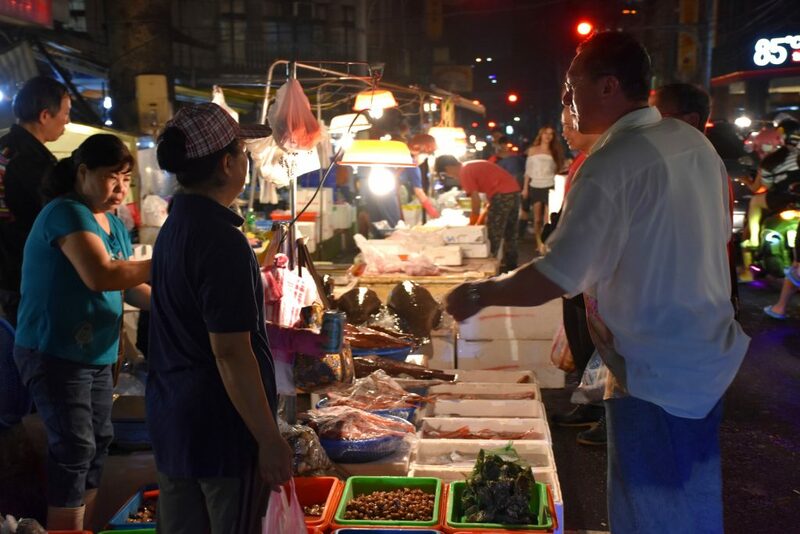 The amount of varieties and sizes and colors of fish you will see and smell is impressive, and it is truly worth visiting at least once in the middle of the night. 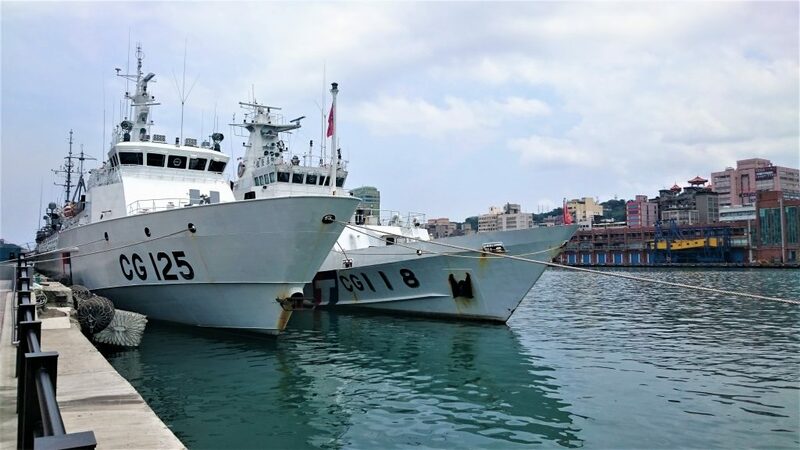 Keelung is a port city, and as such its heart lies at the harbor. You can sit and watch the birds (they are almost solely the official city bird of Keelung, eagles!) and the people and the boats, or you could walk around and visit the many surrounding shops and restaurants. Most of the transportation options you will need are centered right there as well. The port is pretty and its passing breeze seems to give this city constant life. 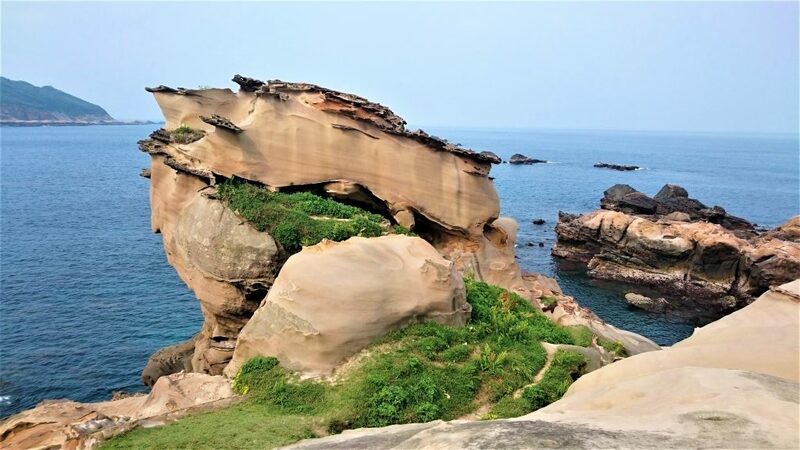 Many things that were on my must-see list in Taiwan before arriving happen to be just a short bus ride away. Badouzi, Yehliu, Jiufen. In addition, when I got here, I added Peace (Heping) Island, the local museums (National Museum of Marine Science and YM Oceanic Culture & Art Museum), Zhongzheng Park, Jinguashi, Shuinandong, Baimiwong Fort, Ershawan Fort, Dawulun Fort, Lover’s Lake, Fairy Cave, and even Taipei’s Elephant Mountain (Xiangshan), and now that I’ve seen almost all these things, I can gladly say this place is in a prime location. It reminds me of my time in San Francisco, where the ocean and mountains and parks and all kinds of colorful things were at the edges and just outside of the city, minutes away, and you could have so many adventures in one day. Here in Keelung, you can be eating Taiwan street food in the late afternoon and suddenly decide to catch the sunset. You still have time! You can get to the rocky coast in a half hour or less. The ocean is special to me, and the coast here is gorgeous with its geological formations, passing ships, and hilly edges. There is a lot of green in and around Keelung, and it is host to several pretty forts and peaceful parks. If you are looking for a break from Taiwan street food and want to sample something sweet with something strong, it’s the coffee shops for you. I lived in China for a year, and it was obvious in most cities I visited that the passion for coffee was simply not the same as it was back home. Also, even a regular black coffee was extremely expensive in China. In Keelung, it’s clear the Taiwanese value coffee, as comfortable coffee shops are ubiquitous. Each has an ambiance similar to that found in Western-style coffee shops, something I have definitely missed. Also, the coffee is cheap in Keelung. And I haven’t even mentioned the tea. Bubble tea, oolong tea, green tea, with all kinds of stuff in it or nothing in it. Everywhere, and delicious. I have been amazed by the friendliness of locals. Even though this city is not a major metropolis, it’s not a tiny town. The streets and sidewalks can get packed. Yet, everyone I have seen so far is courteous and respectful. Many people let me pass or let me cross the street. They say thank you if I open a door for them. They apologize if they bump into me. They smile and try to help if I don’t know what to do or how to speak something in Mandarin. I really appreciate that, and I hope to make more friends here going forward. The local buses are cheap, efficient, and very comfortable. They can get you to Taipei in 30-45 minutes, Badouzi and other coastal areas in 25 minutes, major tourist spots like Jiufen in less than 50mins, and the extremely popular Yehliu in 30 minutes. You can purchase an MRT card for simple electronic swiping (remember to swipe when you get on and when you get off), or you can pay with cash. Most of the buses run very frequently and late into the night, and usually, you have multiple options because there are so many different buses. Yes, this may seem odd to you, but I like the rain because it makes things green and feels good on my head and gives off a peaceful pitter-patter that lets me be highly productive and sleep well. 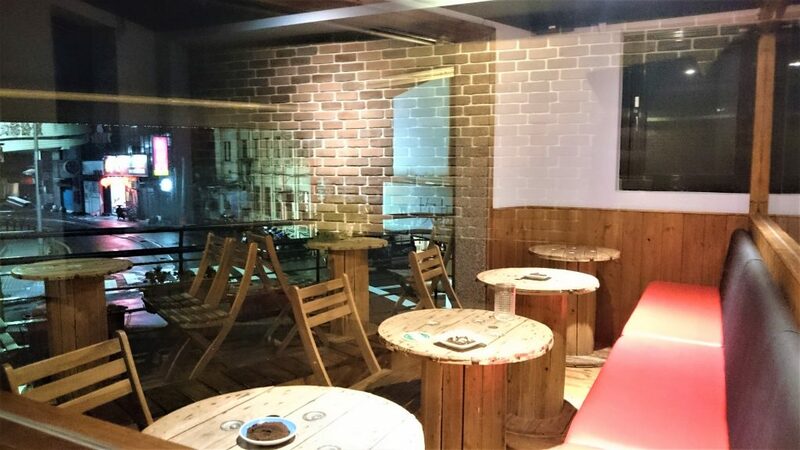 There are many indoor options for entertainment in Keelung, but it can also be fun to get an umbrella and walk around the city when it’s a little wet. Since it rains frequently here, the locals are used to it, and life goes on just as it does with the sun. There’s something beautiful about it. Some people like huge cities, some people like small cities. Keelung is a mix of both, and in my mind, it’s a perfect blend. There are around 400,000 residents in the city, and yet it has so many things that you find in the world’s major cities: international restaurants and fashion brands, restaurants open late or all night with multiple floors of seating, artsy coffee shops, colorful neon signs and decorations, all-night entertainment, good public transportation, very good English signage (except at local restaurants), pervasive Wi-Fi, and plenty of sights. At the same time, when you walk onto a side street or a hillside alley, you are surrounded by the solitude of a small town. Traffic and lines are usually reasonable, the whole city is easily walkable, and prices are cheaper than in bigger cities. And you’re about 30 minutes from the heart of Taipei. Keelung seems to be the best of both big and small city worlds without being either. 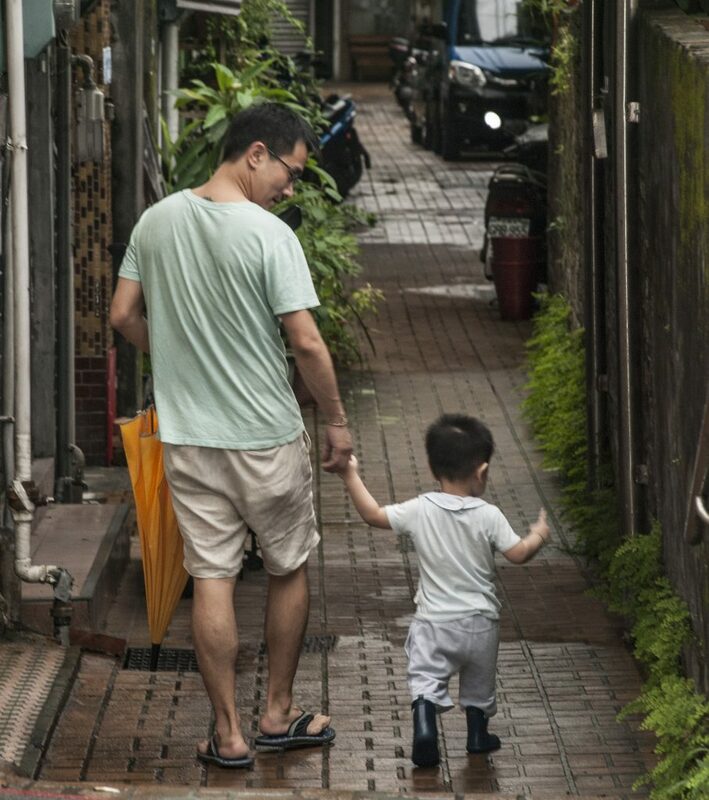 Right now, I am a freelancer in Taipei, Taiwan doing different things including photography and writing. I have been in some crazy situations, and sometimes I have funny things to say. I’ve recently participated in storytelling events to share some of these stories, and I hope to make this more of a trend going forward. When I’m not being humorous, I’m usually taking life too seriously. On rare occasions, I stumble upon a nice middle ground.